LG recently debuted a new 32UL950 32-inch UltraFine 4K display, but this latest model, priced at $1300, wasn't designed in partnership with Apple. It still shares quite a few design similarities with prior UltraFine models, though, so we thought we'd check it out in our latest YouTube video to see whether it's a solid option for the purchase price. 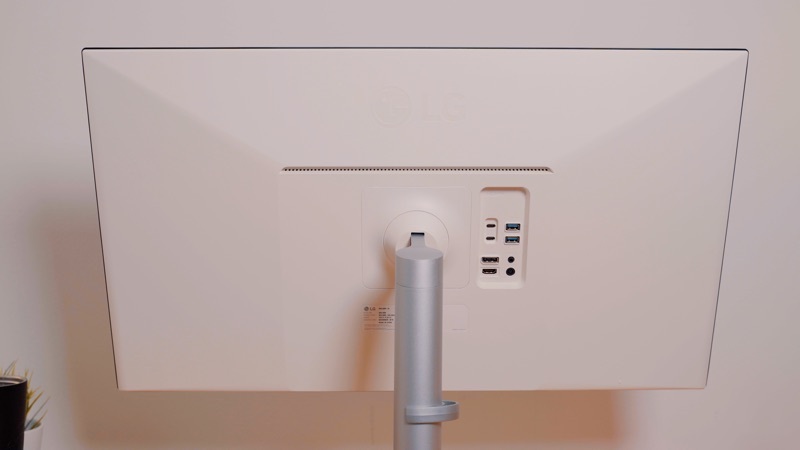 The LG 32UL950 UltraFine Display features a black front panel with slim bezels and a curved base with a plastic monitor arm. It's tilt and height adjustable, so you can get it into the perfect position, and it can even be used in portrait orientation. As with many LG displays, it's VESA compatible so you can mount it on the wall to save desk space. It is equipped with two USB-C Thunderbolt 3 ports, which can be used for fast data transfer, 60W charging for your MacBook, and daisychaining an additional 4K monitor if desired. There are also two USB-A ports, a DisplayPort, an HDMI port, a 3.5mm headphone jack, and built-in speakers. The 4K display of the LG 32UL950 UltraFine is great, with crisp, detailed images and sharp text, though it's not quite as nice as the 5K UltraFine that LG offers in partnership with Apple. This is a 32-inch display, but it's not ultrawide, and it has a resolution of 3840 x 2160 at 60Hz. Running this display at full resolution makes the on-screen elements quite small, so buyers might want to use it at 3360 x 1890 or 3200 x 1800 instead. Other display features include HDR and DCI-P3 support for excellent contrast and color. For content creation or digital media, the LG 32UL950 is a solid choice, but it's not the greatest for gaming because it maxes out at 60Hz. It does support Radeon FreeSync and Dynamic Action Sync, though. LG charges $1300 for the display, but it's available on Amazon at a cheaper price of $1100. That still makes it more expensive than LG's 5K monitor, so it's not going to be for everyone. 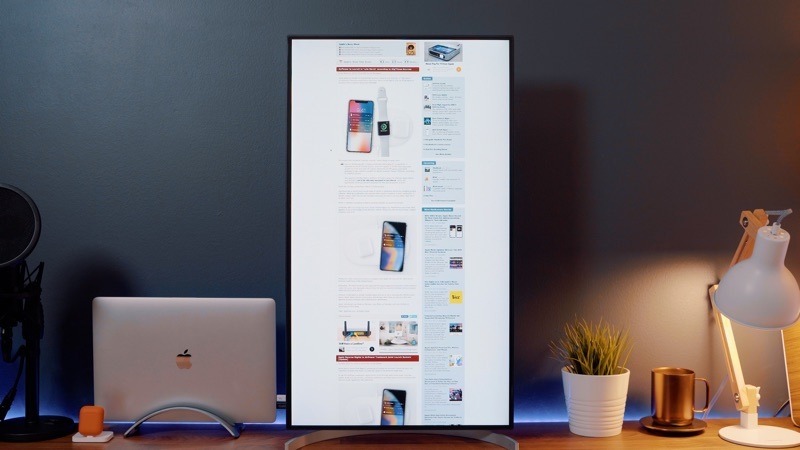 Make sure to watch our video up above for a closer look at LG's new UltraFine display, and let us know what you think of it in the comments below. I own 2 LG UltraFine 5K monitors. They are the best 5K displays available. I have really enjoyed them. Looking forward to see what Apple releases in the future. I hope they stick with LG panels for their Apple-branded displays. LG has the best display technology in my opinion (their IPS and OLED). With all that said, the monitor in this review should not have the UltraFine name or the UltraFine price tag. Also, 27" is perfect for a display size, while 32" is just too big. What exactly is awful about it? 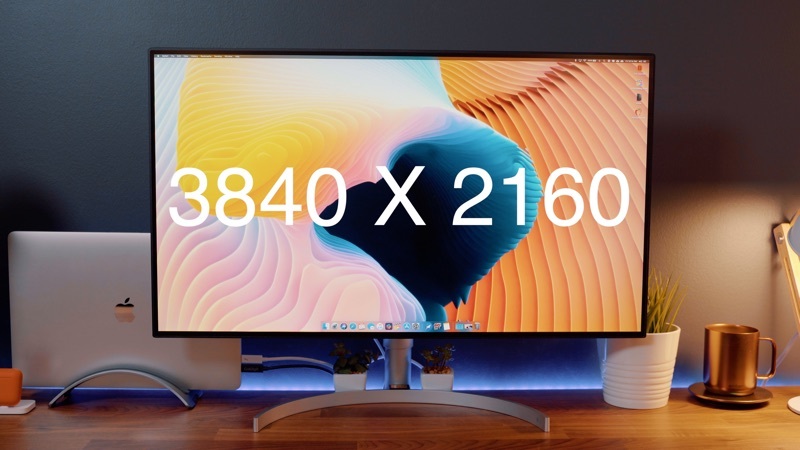 This is a similar display I use for a work desktop and I have no complaints whatsoever, I think this display looks stunning and the color calibration is excellent. Can I get that wallpaper from the video? Thanks. Just wait until you have to deal with LG's unholy return process if it breaks. You won't be singing LG's praises after that. Actually, one of my monitor stands was wobbly and I’ve been out of warranty for a while now. LG sent me TWO brand new monitor stands for free. If you’re familiar with this monitor, you know that the stands are metal and not necessarily a cheap part to give away for free. Also, their shipping packaging was insanely elaborate. I have nothing but great things to say about LG as a company and their products. I also own an LG C8 OLED TV and it is top notch. I own 2 LG UltraFine 5K monitors. They are the best 5K displays available. I have really enjoyed them. For the price it ought to have a higher refresh rate. Current state of monitor market is truly horrible. Same plasticy ugly design. The stands are shaking even if you just slightly touch the desk. How many people are using the monitor in vertical position? Is really necessary to build that functionality in almost every monitor stand? 27" Thunderbolt Display was the last amazing monitor available on the market. Very agreeded. The panels have gotten better but the casing has gotten worse. We now have to put up with wobbly LCD displays. I'm happy to see the $200 price drop. I have been using the 32UL950 for 3 moths now. It is beautiful. I calibrated it as well which took out some of the coolness (blue hue which you see in just about everything). Love the size!!! No comparison to the 27" (personal preference). Love being able flip the monitor 90 degrees on it's stand. It looks so tall! I turned off the local dimming since it was useless with so few zones. I'm using a 2018 18" MBP with no issues with the lesser wattage for charging. My only gripe is having to physically turn off the monitor at night since it turns on every few hours for no real reason (office is next to bedroom). I guess the MBP wakes up to check e-mail/etc. * Design: While not as nice looking as Apple designed displays, I appreciate that the display is free of branding with relatively minimalist look. It looks way better than LG UltraFine series. * DisplayHDR 600 certified: While it's not a great HDR display (see Rting's more critical review ('https://www.rtings.com/monitor/reviews/lg/32ul950')), in the sea where very few competent HDR displays exist, this one stands out as having decent peak brightness performances and wide color gamut. * Twice as fast response time than iMac or LG 5K display. My main concern with 32UL950, beyond it being a large display at 4K resolution (and hence lower DPI), is its incomplete implementation of Thunderbolt 3. To me, TB 3 means it should be capable of charging any battery powered Mac. While 60W is fine for MB, MBA, and 13" MBP (although a bit short of 61W), it cannot charge 15" MBP at full load, and only 1 TB3 input at that. And would it kill LG to not offer 5K version? LG makes a very similar monitor, 32UD99 that is priced lower ($900) than 950 ($1100). I think 950 is meant to replace 99, but 99 has few nicer attributes (beyond lower price): better overall performance (minus HDR) and smaller bezel. On the flip side, 99 includes only USB-C port with much weaker HDR capabilities (no local dimming, darker peak brightness).